Towns in northern Mexico on the Mexico/United States border have faced significant violence in the most recent three and a half years as President Felipe Calderón deployed troops and federal police to curb drug cartels’ power. At least 25,500 people—mainly traffickers and police—have been killed since 2006. This past Monday (June 28) the highest profile political assassination of the last 16 years took place as Rodolfo Torre of the Institutional Revolutionary Party (or PRI) along with four of his aides were killed by suspected drug hitmen. Torre was anticipated to win the July 4th gubernatorial election in the northern Mexican state of Tamaulipas. The Sisters of Mercy have ministered in Mexico since 1980. 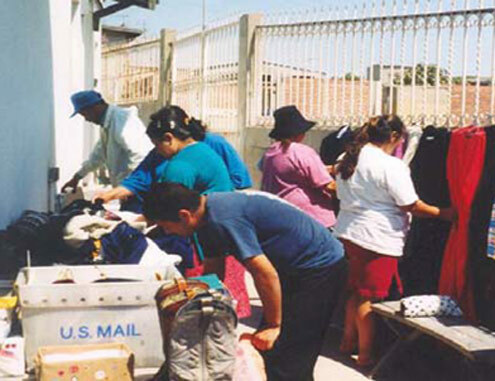 Initially, Ruth Marie Hotz rsm and Lucina Kozeny rsm worked with economically poor families in Rosarito, Baja California Norte, in providing food, clothing, and household items. They have returned to Nebraska (USA) for health reasons, and Clare Manhart rsm has continued this ministry of Project Love, Hope, Trust. A major part of this ministry is to provide for the education of kindergarten through preparatory school students through fundraising for tuition, uniforms, and school supplies. In addition, classes in computers, sewing, crafts, cooking, English, religion, and scripture are offered. Another Sister of Mercy living and ministering in Mexico is Betty Campbell rsm. She lives in Juarez, the Mexican border city that has El Paso, Texas (USA), to its north on the other side of the Rio Grande. She lives in a barrio of maquiladora workers (sweatshop factory workers) in solidarity with people who are poor and is part of a community of contemplation and political action, Tabor House. This community receives many delegations from the United States and helps them see how U.S. foreign policy is responsible for much poverty and violence in Latin America. 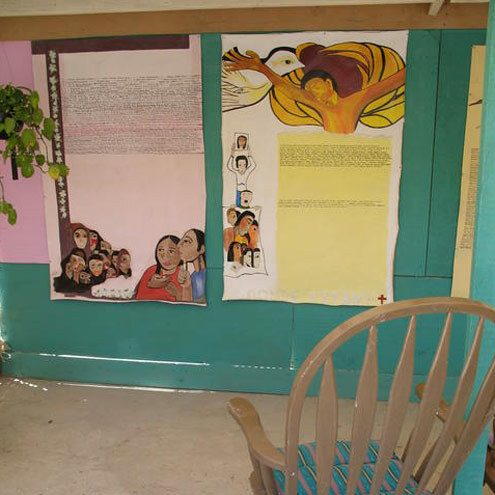 Betty’s backyard has three murals which she has painted that collect (1) names of women assassinated or disappeared in Juarez; (2) names of those who have died in attempting to cross the Mexico/U.S. border; and (3) names of Latin American martyrs and others who have given their lives in resistance to injustice. “The Remembrance Wall” (picture from www.cpt.org/index.php?q=gallery&g2_itemId=9978&g2_page=6). In addition to Clare and Betty who live and minister full-time in Mexico, several other Sisters of Mercy live in border towns on the U.S. side and minister part-time in Mexico providing pastoral services, alternative health services, and other forms of accompaniment to migrants and refugees. Some of this ministry is located in Nuevo Laredo as a number of sisters live in Laredo, Texas (USA). The canonical novitiate for the Institute of the Sisters of Mercy of the Americas, serving women entering in the United States and Guam, is located in Laredo, Texas (USA), and the women in the novitiate have frequent experiences of ministry and prayer at the Mexico/U.S. border. The leadership team for the Institute of the Americas has joined the women in some of these experiences on their trips to Laredo, and share reflections and challenging questions of their prayer in the following article: www.sistersofmercy.org/documents/page_1.pdf. Another article reflecting on experiences at the Mexico/U.S. border is written by Patricia Dervish: www.sistersofmercy.org/documents/131415marapr09en.pdf. She ministered in El Paso, Texas (USA) and Juarez (Mexico) for a year through Mercy Volunteer Corps. Maria Campos rsm is a Sister of Mercy living and ministering in California (USA). She has spent every summer since 1984 ministering with Mayan women in Chiapas (Mexico) and has recently assisted them in establishing an artisan cooperative where women can teach the girls in Mayan crafts and arts, and both can earn some additional income. Mercy educational and health care institutions in the United States are also involved in ministry in Mexico from week-long service trips for colleges to the regular medical trips of Mercy Outreach Surgical Team of Scripps Mercy Hospital of San Diego, California. This surgical team of volunteer nurses, technicians, and doctors provides surgeries for needy children with cleft palates and lips, burn scars, crossed eyes, and other conditions. 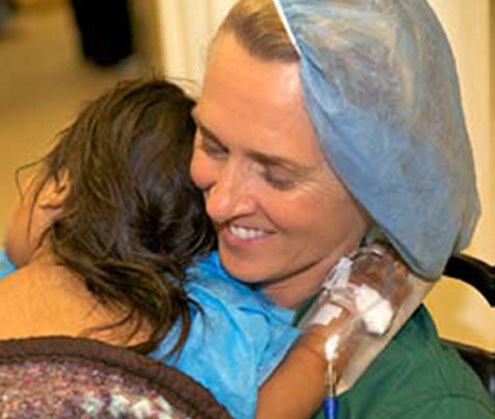 In the last two decades, they have assisted nearly 9,000 children and adults in Mexico. To read more about the surgical team, visit: www.scripps.org/about-us__scripps-in-the-community__community-health-improvement__mercy-outreach-surgical-team-most or their most recent newsletter: www.scripps.org/assets/documents/most_spring_newsletter_2010.pdf.